0. 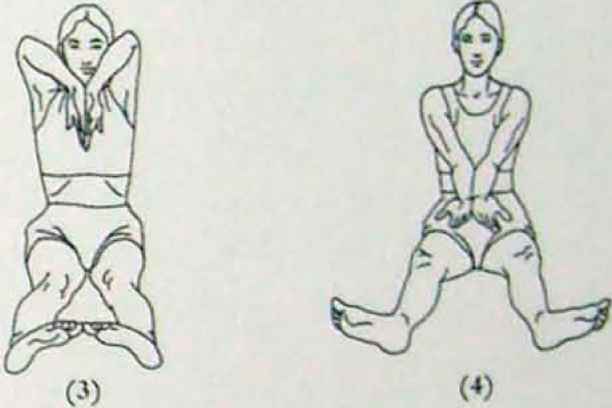 Sit with your logs extended forward with a distance of one span between the heels, the toes turned outward, and your hands on your knees with the palms facing upward. 1. 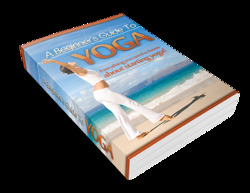 Inhaling forcefully, opening the chest and shoulders, join the backs of the hands and raise them to your neck, with the fingers pointed downward. 2. Exhaling forcefully, make the opening lotus' mudra 65 with your hands, lowering and joining the elbows and opening the palms upward. 3. Inhaling forcefully, make the closing lotus'66 mudra rotating the hands, forearms and wrists, opening the elbows and joining the backs of the hands with the fingers pointed downward. 4. Exhaling forcefully, repeat the opening lotus" mudra (as in point 2) and repeat the opening and closing exercise (points 3 and 4) three or seven times. In this exercise, when you open the hands turn your toes outwards; when you join the backs of the hands, bring the toes close together. Also, your right eye should follow the movement of the right fingers and your left eye that of the left fingers. 5. At the end. inhaling forcefully, raise your arms straight (over your head). As stated, this yantra helps to overcome sensory motor dysfunctions of the four limbs and the head, problems of the muscle tone, ailments of the major and minor joints and, in particular, all problems of the pervasive prdna. By inhaling and exhaling 4jttt ckh and forcefully in all these (exercises^, you should loosen the five sense organs and the joints. 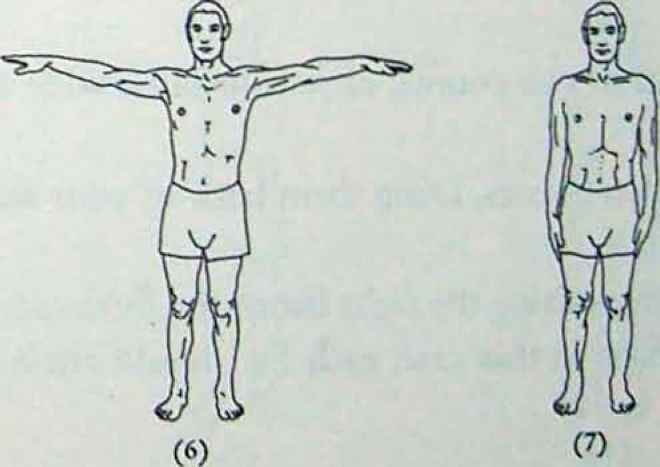 Thus it is necessary to practice diligently these five exercises, breathing directly and forcefully, in order to make the eyes and the other sense organs flexible and loosen the major and minor joints of the waist area and the other parts of the body. 4. Exhaling Quickly or Phcnpa. 1. 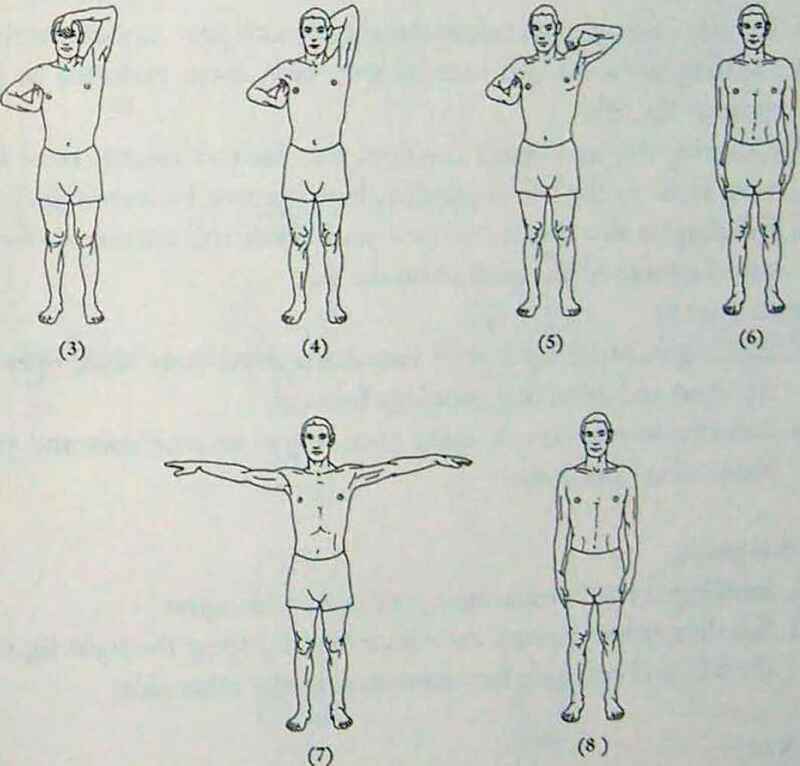 Inhaling in two counts, on the basis of the breathing rhythm explained in the Four Profound Applications,70 in the first count grasp your left arm with the right hand above the inside of the elbow and in the second count, grasp your right arm with the left hand in the same way,71 raising jour folded arms to shoulder height. 3. Inhaling slowly in four counts, raise your folded arms above your head and straighten your torso. 4. Holding the air open tor two counts, tense'2 your whole body. 6. Inhaling in two counts, raise your arms extending them wide apart to the sides. 7. Exhaling in two counts, bring your arms back to your sides. Repeat the exercise three or more times. As stated, this yantra enhances the intellectual faculties bringing greater lucidity, improves the physical condition, and eliminates all kinds of ailments of the five full organs: heart, lungs, liver, spleen and kidneys,74 caused, for example, by their having become weakened. Hotfirg O/wvi: Standi^ rotate the fists around the forehead. 4. 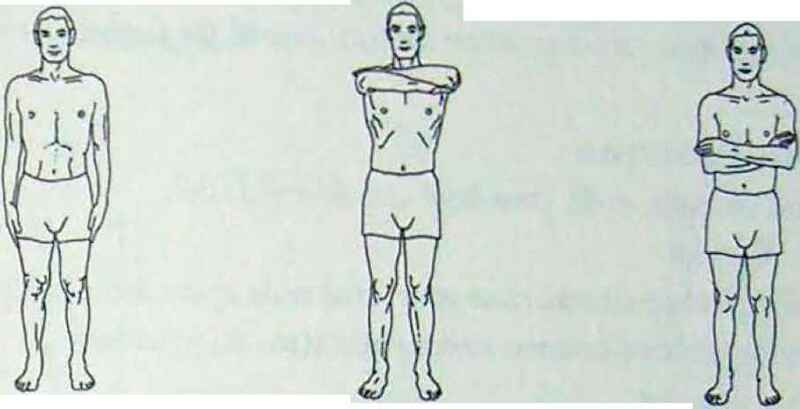 Holding the air open for two counts, stretch your left elbow and rotate the fist from your forehead to the back of the head, lightly touching your left ear. 5. Maintaining the open hold while also directing the air,77 rotate your fist quickly and forcefully from the back of your head, lightly touching your right ear. to your forehead at eyebrow level, and ending the rotation beside your left ear. 6. Exhaling in two counts, in the first count extend your straight arms apart, in the second count lower them down to your sides. 7. Inhaling again in two counts, raise your arms wide apart and open your chest. rf. Exhaling in two counts, bring them back to your sides. 1. 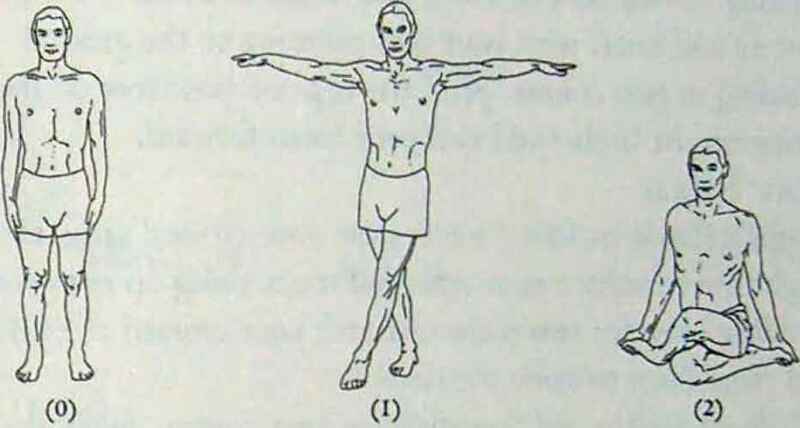 Inhaling in two counts, raise your arms wide apart and bring the left foot alongside the outside of your right ankle. 2. Exhaling in two counts, sit down on the ground crossing your legs with the left knee over the right, grasping the sole ot the left foot with the right hand and the right foot with the left, joining thumbs and big toes and straightening your arms. 4. 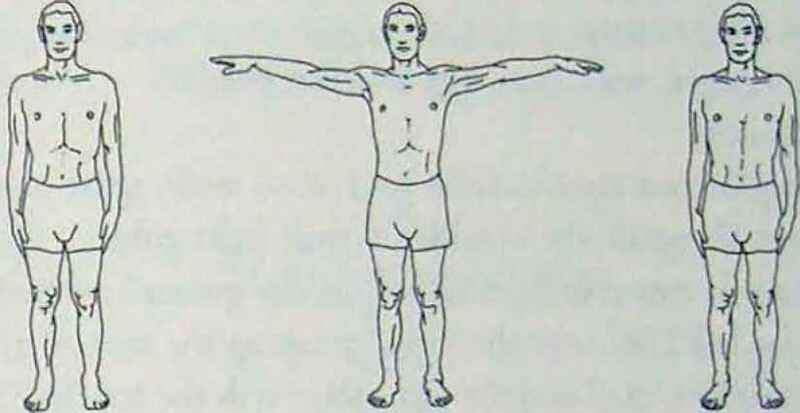 Holding open for two counts, keep your torso extended as you twist to the left. 6. 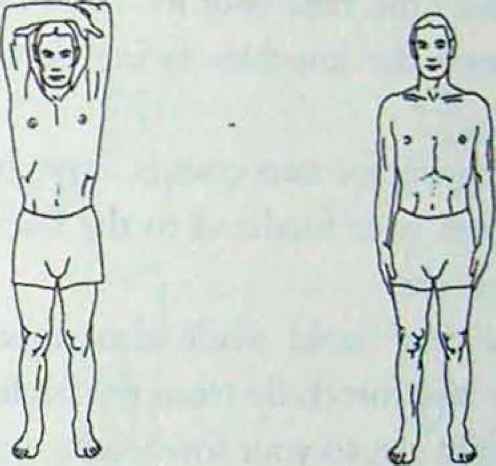 Exhaling in two counts, stretch your torso still further to touch your forehead to the ground on the left. 7. 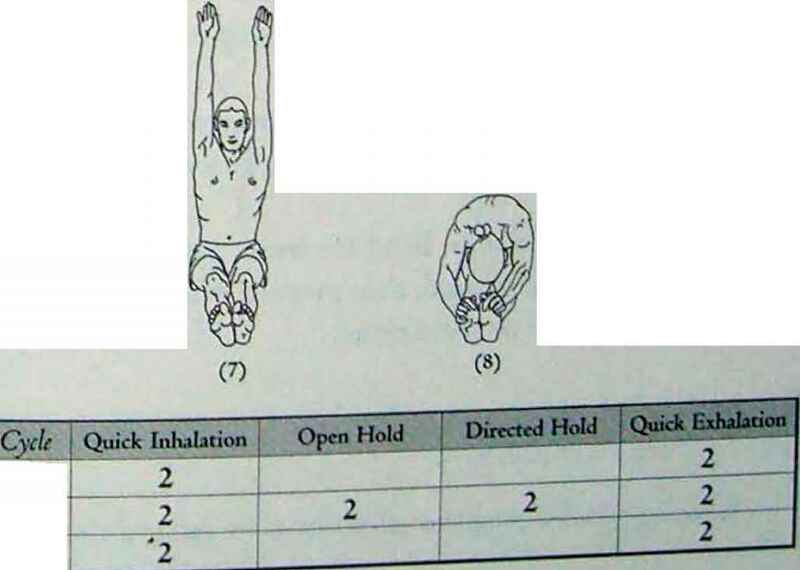 Inhaling in two counts, raise your arms above your head, opening the chest and extending your legs forward. 8. Exhaling in two counts, bring your fingers to your toes and your forehead to your knees. 2. Exhaling in two counts, cross your legs, bringing the right leg over the left, and continue the movement on the other side.